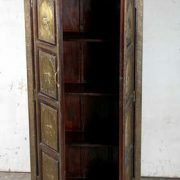 Vintage teak display cabinet with art deco doors. This vintage teak display cabinet is an excellent example of how beautifully teak ages over time. The golden brown wood gains a more rustic feel and the grain becomes more delightfully pronounced adding to the charm and character of pieces like this art deco style cabinet. The top of this cabinet is simple and sleek on its outer edges that house a display shelf with glass on the front and both sides, making the perfect platform for displaying your favourite ornaments and knick knacks. Below this is a cupboard with unique hand made doors ornately decorated in the art deco style. The cupboard itself has two internal shelves, leaving three spaces for storage within. The whole exquisitely made unit sits on top of four slim wooden feet. 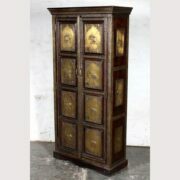 A really quite beautiful cabinet, this would sit perfectly in a kitchen, dining room or hallway.